In a recent poll, 31% of voters said they would vote for UKIP, if they knew they had a chance of winning. The main question that comes to mind is: WHY? Why are UKIP so popular? Firstly, UKIP capitalises on the public's distrust of Westminster politics. This means that the antiestablishment notion of "ordinary folk against the political class" (a direct quote from UKIP's first election broadcast) seems extremely appealing. UKIP's "People's Army" therefore increases with more and more of the politically disillusioned. Ironically, Farage is far from our shared image of an "ordinary bloke." A white, middle aged straight man, educated in a private school, previously a city broker and now funded by various Eton graduate investment bankers, there does not seem to be much to distinguish him from the other parties it claims to be an alternative to. It seems his strongest link to being an "ordinary bloke" is his ability to balance a pint on his head, and have an "open, easy-going personality" (according to my friend). In addition, most of UKIP's policies seem to be policies for the rich - their plan to scrap inheritance tax, for example, exacerbating the problem of the rich keeping the cycle of inherited money within a family, and their 35p income tax pledge may actually punish the moderately well-off at the expense of the even richer. Although recent studies have shown that migrants actually contribute £25 billion to the UK economy, UKIP are most famous for their policies on immigration. Perhaps intentionally, they have exploited the public's fear of immigrants, how they're using our resources, taking away jobs and housing, not paying taxes and exploiting us. They demand "an end to uncontrolled unskilled migrant labour coming into Britain," taking the jobs that Britons could have occupied (yet the only kind of jobs that would be freed up by not accepting any more unskilled migrant labourers would be the kind of jobs not many are attracted to - ie. unskilled labour). UKIP's immigration policy would also include controlling the "quality" of those who enter the UK - including their health, as well as their ability to work. He even stated that those with HIV should not be allowed into the country. This scapegoating has increased hatred towards migrants even more than previously, which does nothing for the unified, unprejudiced, and accepting society that Britain should be. Innocent people who just want a better life are being demonised, for problems out of their control. Many unsavoury characters have been attracted to these policies, including those such as Kevin O’Doherty, a UKIP council candidate who has said that there is "no such thing as a benign Muslim," and has been pictured with tattoos containing Nazi imagery. Another (later fired) joked that storms were caused by the government legalising gay marriage, and Farage himself has said that women who take maternity leave are "worth less" to their employers than men. Although most of these claims are the fault of individuals and not the party as a whole, it still goes to show which party racists and homophobes choose to join. These are obviously just thoughts about UKIP, their exponential popularity and a few of their policies. You're entitled to your own opinion, but I'd advise you to think twice before you vote UKIP. On Thursday 12th March I had the pleasure of attending a Teen Empowerment Conference at Thomson Reuters in Canary Wharf which I had been invited to speak at by the Rocking Ur Teens company as an #iwill Ambassador along with other young girls and women. This conference was the first event held by the company and it was an amazing opportunity for 13-14 year old school girls to learn about opportunities available to them, meet girls from different walks of life and to be challenged to make a difference and realise their own power. The day started off with a welcome from the quirky young presenter Remel London and a Keynote Speaker session. This session included speeches from Emma Barnett, the Women’s Editor of the Telegraph, Yasmin Ali, Young Woman Engineer of the Year 2013, and Grace and Amelia Mandeville (The Mandeville Sisters), Presenters and two of my favourite YouTube Vloggers whom I was lucky enough to get to sit next to for most of the day! These women shared how they became successful and how they approached opportunities in their careers. Hearing how they got to where they are now was encouraging and inspiring to me and hopefully to the other girls too. After this, the students had time to learn more about leadership, entrepreneurship, jobs and making good choices, through workshops in different rooms. While this was going on I was still in the main hall with the other speakers trying to gather the courage to speak to The Mandeville Sisters, that is until my mum took action and introduced me to them for me (thanks mum). A little off topic but that just made the whole event even better! I also had the chance to speak to Remel London about her career and it was incredible to hear how much she has achieved such as graduating with a BA Degree in Broadcast Journalism, becoming a presenter and interviewing celebrities, actors and music acts, including Jessie J, at just 25 years old! We then had lunch before hearing from graduates, interns and school leavers about corporate life and their involvement. It was helpful to learn how these women chose their courses and how they started life after education. We also heard from Marsha Powell, founder of BelEve UK, and she gave everyone steps to making good choices for future success. Marsha’s speech got everyone thinking about choices and how we make them and everyone learnt the same thing from her speech, make decisions for yourself and make choice that make you happy. The last set of speeches for the day was by #iwill Ambassadors (myself and two other young women), we were there to represent the Step Up To Serve charity and to talk about our social action journeys and how we have made a difference through volunteering. This was my first ever public speech and to be completely honest, I was so nervous that I don’t even remember what I said! I just spoke about my role as a mentor and how that has opened so many opportunities for me that I would not get any other way. Through volunteering as a mentor, I’ve become a proud ambassador for a national charity, I’ve spoken at an important event and I have spoken to Prince Charles! I believe that my social action journey proves that even the smallest action can make an enormous difference in a community and even in your own life. At the end of the conference we had a special musical performance from Tendai and then it was over. Before I left I got to speak to the founder and co-founders of Rocking Ur Teens and they offered me more opportunities! One of the co-founders, Jenny Garret, suggested that at the next conference I could have my own workshop to present and Jenny also said it is likely that Nonsuch will be invited to attend next year’s event! Being at this conference and speaking has taught me so much about myself and how I can make my future better as well as helping others. I’ve realised that every opportunity is important, if you want something and you have the chance to get it, take that chance because it could be the only one. I have also learnt that every mistake counts. I know the women who spoke to us did not become so successful easily and they must have been turned down or disappointed many times before they found the opportunity for them and it’s the same for everyone and it’s so important to embrace mistakes and to learn from them, especially in your teenage years. The so-called Anarchy of the 12th century – the civil war in England and Normandy between King Stephen and the Empress Matilda - is an exciting yet surprisingly neglected period of history. It often appears only as a background for the story of Henry II, Matilda’s son, or as a brief sidenote in Tudor history textbooks, using Matilda to comment on the perceived calamities of having a Queen Regnant. In the second half of the 20th century, with the discovery of the second half of the Gesta Stephani (a very important contemporary chronicle) and the subsequent publication of RHC Davis’ King Stephen, still considered to be the ‘Bible of the reign’ (Jim Bradbury, 2004) the Anarchy has finally received a bit more attention. Sharon Penman’s When Christ and His Saints Slept isn’t the only popular work of literature to be set during the period. It is portrayed reasonably accurately in Ellis Peter’s Cadfael series, and less accurately in the nevertheless acclaimed novel The Pillars of the Earth by Ken Follett. At a hefty 900 or so pages, Penman’s novel is the first to focus on the key political players rather than characters on the periphery, and does so with commendable accuracy. The narrative begins in 1120, with the sinking of the White Ship, a disaster that claimed the life of William the Æthling, the only legitimate son of Henry I, thus throwing the royal succession up in the air. In 1126, King Henry ordered the barons to swear an oath of fealty to Matilda (known in the novel by the vernacular version of the name: Maude) as his heir. She was then married to Geoffrey, Count of Anjou, enemy of the Normans. Fears of being ruled by a woman, and of having an Angevin as the King, the barons did not offer Maude their support when Henry I died in 1135. Instead, they offered it to her cousin Stephen, who quickly sailed from France to claim the crown for himself. The novel then details, from various perspectives, the 19 year civil war that ensued. Two thirds of the way through, our attention switches to France, to Eleanor of Aquitaine. Having heard snippets of her story through the gossip of other characters, we now see for ourselves marriage to Louis IX disintegrate, and Henry of Anjou’s successful bid to wed her himself. The novel closes with the death of Stephen the accession of Henry and Eleanor as King and Queen of England. 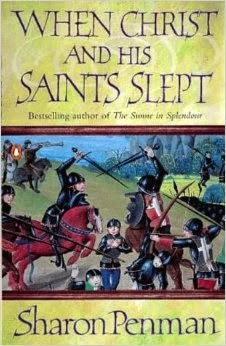 Saints is actually the first novel in a trilogy about Eleanor of Aquitaine, so it finishes with an annoyingly prophetic ring of triumph for dramatic effect. The 21st century has already seen significant progress in revising Stephen’s reign and the extent of the chaos it caused. Published in 1994, Saints obviously doesn’t include this, meaning that behind the heavy research woven through the text, there remains the underlying assumption that Stephen was a kind man but an utterly hopeless King. In its bare essence, this is true, but it would have been nice to see a more open attitude to the Scottish truce in 1148, or the appointment of Theobald of Bec as Archbishop of Canterbury. Stephen had sensible reasons for making these decisions, no matter how disastrous the consequences. There is also some debate as to the strength of Maude’s power base, and the equal weighting Penman gives to Stephen and Maude may not have been strictly the case, but the lack of evidence and a division of historical opinion for some leeway here. Obviously, Penman is a novelist, not an historian, so perhaps this nit-picking on my part is unfair. However, she researches her novels better than most other novelists, and so I feel inclined to raise the bar. Something that intrigues me about Penman’s writing is her decision to switch suddenly between fiction and non-fiction at the end of chapters. Occasionally, she will give us an overview of what happened, accompanied with a quotation from a contemporary chronicle. Sometimes this works to the novel’s advantage, allowing the reader to consolidate what they know, and reminding them that these are not merely characters, but historical figures. It encourages reflection and caution when reading. At times, however, all it serves to do is pull the reader out of the narrative. Also, I’m a great lover of monastic chronicles, and they aren’t nearly as inaccurate as some people make them out to be, but planting extracts in the novel creates unhelpful melodrama. England was not completely desolated by the Anarchy, and the chronicles give the opposite impression. One of the peripheral characters in the novel is Ranulf, an illegitimate son of Henry I and staunch supporter of Maude, though his past in Stephen’s service allows him to be more open-minded than some of the other characters. Ranulf does not exist in the historical record, but is an original creation of Penman’s. As she writes in her author’s note: ‘Since Henry I is known to have sired at least twenty illegitimate children, I decided one more wouldn’t hurt!’ Thankfully, his presence does not upset the historical narrative. Instead, he is a charming and relatable character, who endears himself to us early in the novel. Even I – who tend to dislike original characters in historical fiction – found myself growing rather attached to him. The problem comes when Ranulf runs away to have adventures on his own. These adventures in Cantebrigge (now Cambridge) and Wales were entertaining in their own right, but as someone who picked up the book to read about the actual historical personalities involved, it did grow tiresome when none of them appeared for 50 pages at a time. I didn’t come to the novel for romance and heroism – as important as those things were in the 12th century anyway – but for political intrigue and siege warfare. Thankfully, these were also in abundance, and were covered in extraordinary detail. The pages dedicated to the Rout of Winchester were a tour de force in world-building. Another aspect in which Penman has done an admirable job is in naming her characters. The medieval nobility were notoriously unimaginative in naming their children, and Penman has managed to juggle four Matildas, two Henrys, two Theobalds and an uncountable number of Williams around in such a way that one is rarely confused. It took a while for me to accept that the Empress was called Maude, not Matilda, but I had 900 pages to warm to the idea. Historical novels are always a drag when you already know the story, a fact that is not helped when the book is heavy enough to use as a weapon. It’s heavy-going, but if you’re fond of the period, Saints is definitely worth a read.